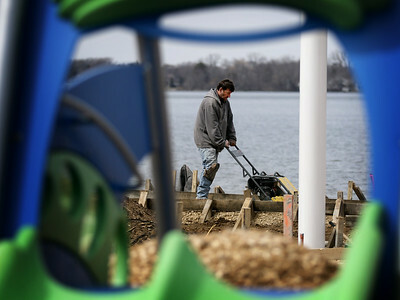 Bennie Sizemore compacts the subs for an asphalt path to the new playground and boat marina at Main Beach on Thursday, April 5, 2018 in Crystal Lake. Construction should be finished in time for the opening of the beach. 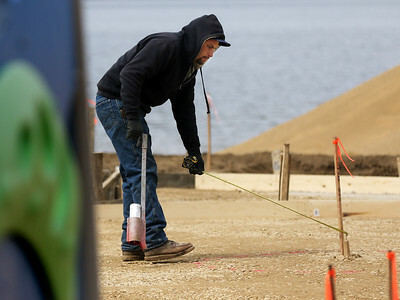 Foreman Martin Nevares paints lines on the compacted ground where decorative cement will be poured underneath a new shelter at Main Beach on Thursday, April 5, 2018 in Crystal Lake. Construction should be finished on the new playground and boat marina in time for the opening of the beach. 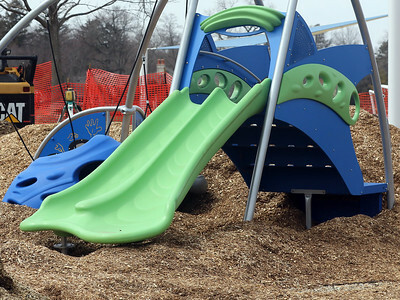 Mounds of wood chips are piled up around new playground equipment as construction crews work on the new playground and boat marina at Main Beach on Thursday, April 5, 2018 in Crystal Lake. Construction should be finished in time for the opening of the beach.